Save time by signing up for our FREE valet service! Our Valet Route Specialist will pick-up your garments at your home or office and return them to you stain-free, store fresh, and ready to wear. There is no need to be home to use this great service. Upon signing up you will receive two personalized delivery garment bags. Simply put your garments in the bag and leave them in your chosen designated location and your clothes will be returned to you on the following delivery day. You will be charged on the first of the month for your previous months cleaning and we will sent you and electronic statement. 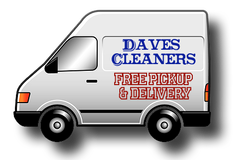 There are no fees or minimums for delivery service, simply pay the normal cost of your cleaning. We also offer a "Call As Needed" Option when signing up if you do not require weekly cleaning. Just give us a call the day before your areas delivery days and we will be glad to pick up. Your clean garments will be delivered back to you the following delivery day. 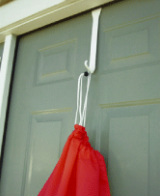 We offer complimentary door hangers (pictured below). Please let us know if you would like one. 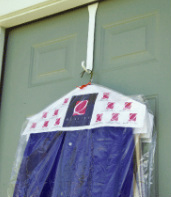 They work great if you have a storm door to protect your clean garments.